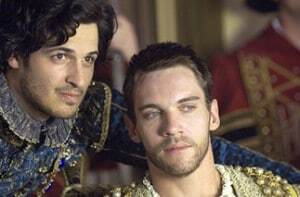 The episode opens with Henry VIII arriving at Val d’Or, the Valley of Gold, where the Field of the Cloth of Gold meeting between the French and English Kings is to take place. Henry VIII rides out alone to meet Francis I. In the tent, Cardinal Wolsey asks the two Kings to place their hands on the Bible and swear that they will be true, virtuous and loving to each other. They swear. The Dauphin and Princess Mary are brought in and introduced to each other as future bride and groom. Mary kisses him and then pushes him over when he complains. A fountain is running wine. Henry points out to Thomas More that the Palace of Illusion is cloth. The Kings exchange gifts – jewels from Francis to Henry and a pie of live birds from Henry to Francis. Francis points out Mary Boleyn to Henry, saying “I call Mary my English Mare because I ride her so often”. Henry is not amused. Thomas Boleyn tells Mary that the King has noticed her and that he wants to see her. Mary tells her sister, Anne. Henry has his beard shaved off while listening to Thomas Tallis sing. Thomas Boleyn tells Cardinal Wolsey of the Duke of Buckingham’s views on him and his plotting against the King. Wolsey tells him to say nothing to anyone. Francis boasts of France’s brilliance – its poets and painters, the most beautiful women, the best wrestlers etc – so Henry challenges Francis to a wrestling match. Francis wins so Henry tells More to tell the French that he will not sign the treaty. More tells him that he will obey his orders if Henry really wants the French to think he is easily changeable, shallow and incapable of keeping his word. Mary Boleyn is brought to Henry’s bedchamber. Mary shows him the “French graces” she has learned while at court! Henry and Francis sign the Treaty of Universal and Perpetual Peace. Henry wrecks his tent, throwing furniture and breaking things. Even Mary Boleyn can’t take his mind off things. Henry shouts at Wolsey. He is angry that the Queen’s nephew, Charles, has been elected Holy Roman Emperor and now has vast dominions and wealth at the age of 20. Henry wants Wolsey to visit him as it may be better to do business with him, rather than the French. Thomas Boleyn visits Buckingham, massaging his ego and encouraging him in his plotting. Wolsey tells Henry about the Duke of Buckingham raising an army and borrowing money. Henry tells Wolsey to invited Buckingham to court for the New Year. Henry meets with Thomas More and asks him about his family. More tells him about how he is educating his daughters. Henry tells More of a gift he has received, Machiavelli’s “The Prince”. It is very different to More’s Utopia. Henry finds the question whether it is better for a King to be feared or to be loved an interesting one. He tells More of Buckingham’s plot to kill him. Wolsey visits Lady Blount who is heavily pregnant. He tells her that her husband is reconciled to her condition but he does not know whether the King will recognise her child. Buckingham’s Estate, Penshurst – Men visit him, pledging their allegiance to him. Wolsey tells More that the King has asked him to meet the Holy Roman Emperor and draw up a new treaty uniting them against the French. More is disappointed, Wolsey is realistic. More is worried that the King does not trust him. Wolsey advises him that if you want to keep a Prince’s love you must be prepared to give him the thing you most care for in all the world. More says he cares most about his integrity, Wolsey does not say what he cares about. Buckingham arrives at court for New Year. He gives the King a clock with the words “with humble true heart” engraved on it. Lady Blount gives birth to a baby boy. Buckingham leaves court and is intercepted by Sir William Compton and Anthony Knyvert who arrest him on suspicion of treason. Buckingham is convinced that a jury of his peers will not find him guilty. Henry tells Wolsey that he is appointing peers to judge Buckingham and that Norfolk will be first among them. Wolsey advises him that it may be dangerous to find the Duke guilty of treason and perhaps he could be found guilty of a lesser offence and fined and banished from court. He would be disgrace but his friends and allies would have no cause to rise against the King. Mary Boleyn tells her father that the King does not call for her at night anymore. Charles Brandon sees the Duke of Norfolk to make sure that he knows his responsibility at Buckingham’s upcoming trial. Henry has sent Norfolk his father’s ring. Norfolk tells Brandon of how his father was executed by the King’s father. The Duke is with his son who is going to be received by his godfather, the King. Brandon warns Norfolk to think of his son’s inheritance and not to deprive him of his father, title and ring. Buckingham’s trial – Norfolk tells Buckingham that he has been accused of treason and imagining and plotting the King’s death. The court of high stewards finds him guilty, much to Buckingham and Wolsey’s dismay. Buckingham is sentenced to death and accuses Wolsey of it being “all his doing”. He finds the clock he gave the King in his cell. Buckingham is beheaded while the King visits Bessie Blount to see his son. Buckingham is forced to lie down at the block. henry holds his baby son. Knyvert calls Buckingham a coward and holds his arms out so that the executioner can strike. Henry celebrates having a son. He fires his flintlock. He is happy that now he knows that it wasn’t his fault that he and Catherine did not have a living son. Wolsey tells Lady Blount that the King will recognise his son, naming him Henry Fitzroy and giving him his own establishment at Durham House. The Queen arrives, raises her goblet and then leaves, leaving Henry to carry on celebrating. The Pope is on his deathbed. Bishop Bonnivet tells Cardinal Campeggio of his deal with Wolsey, that in return for England not going to war with France that he had promised Wolsey the French vote. He is told that Wolsey is going to meet with the Emperor and therefore plans to break the treaty. Bonnivet is no longer obliged to keep his end of the deal. The Pope dies. A barefoot Catherine of Aragon visits a shrine and prays to Our Lady for a son. Wolsey tells More of how the court is leaving Whitehall for Hampton Court because of an incident of sweating sickness. Wolsey breaks down, someone else has been made Pope. More speaks of Luther and how he knows that Wolsey would have worked to stamp out corruption. Lady Blount encounters the Queen, who ignores her. The court moves to Hampton Court. Anne Boleyn arrives her court. She is greeted by her uncle, the Duke of Norfolk, and her father. Thomas Boleyn tells her that the King is tiring of her sister. He explains that their fortunes will fall unless…. Anne is concerned that even if the King had her, he would not keep her. Her father is sure that she can find a way to keep his interests more prolonged, that she learned in France how to play a man’s passions. “There is something deep and dangerous in you, Anne. Those eyes of yours are like dark hooks for the soul.” Anne smiles. Henry meets with Wolsey. Wolsey tells him that the Holy Roman Emperor has agreed to a treaty and that in return that there will be a joint invasion of France for the overthrow of King Francis. Henry wants to claim the crown and be King of France. He comments on the beauty of Hampton Court Palace, saying he has nothing to compare to it. Wolsey gives it to him. Mary Boleyn’s relationship with the King – In the series, Mary Boleyn’s relationship with the King is very shortlived but in reality it lasted for around three years, at least, and some people believe that her two children were fathered by the King. Anthony Knivert/Knyvert is a fictional character – He may have been based on Sir Thomas Knyvert, a favourite of the King, who died in 1512. Princess Mary was actually promised to the Dauphin in marriage when she was 2 and he was a baby. This arrangement did not take place at the Field of the Cloth of Gold. The Treaty of Universal and Perpetual Peace in this episode is based on the Treaty of London, a peace treaty promoting everlasting peace in Europe, between France, England, the Holy Roman Empire, the Papacy, Spain, Burgundy and the Netherlands, which was signed in 1518 and did not have anything to do with the Field of the Cloth of Gold. Thomas Tallis, the English composer, did not appear at Court until 1543 when he became a Gentleman of the Chapel Royal and started to compose for the King. Edward Stafford, Duke of Buckingham was executed on the 17th May 1521 and Henry Fiztroy was born two years earlier, on the 19th June 1519. Henry VIII’s gun – In this episode, we see Henry firing a flintlock, yet the first flintlock was not made until 1610. Hampton Court Palace – Henry VIII stayed at Hampton Court Palace in 1525 but Wolsey did not give the palace to the King until 1528. Anne Boleyn – Anne Boleyn was recalled from France to marry James Butler not to catch the King’s eye. There is no evidence that Thomas Boleyn purposely “pimped” out his daughters to the King. Lady Blount did not marry her husband, Gilbert Tailboys, until 1522 and was single when she gave birth to Henry Fitzroy. Henry VIII and Francis I did have a wrestling match at the Field of the Cloth of Gold and Francis I did win. The Palace at the Field of the Cloth of Gold was made out of canvas. It covered 10,000m2 and above its 2m high brick base were 10m high canvas walls. Red wine really did flow from the fountains at the Field of the Cloth of Gold. In this episode, we see Anne Boleyn wearing the Anne Boleyn Moonstone Earrings, the gold-plated Anne Boleyn B Necklace and the Anne Boleyn Pearl Crystal Headband. This is absolutely fascinating! I am so impressed. This is like a crash-course in Tudor history, in an easy-to-swallow little pill. (Some of us wouldn’t mind a whole bottle of Tudors, and feel we could never overdose!) BRAVA, CLAIRE!! excellent series…costuming makes me want to designer for myself. Henry’s wear—is just magnificent……see alot of indifference in England’s Court, and appreciate the information that was not real…….the fiction notes are invaluable for me as a History Professor. I think there is another inaccuracy regarding the pope. The newly elected pope in the series is cardinal Orsini but in reality the pope was Francesco Todeschini Piccolomini who had one of the shortest pontificates in history (less than a month) followed by Giuliano Della Rovere. Sorry for pointing out such a small detail but to me it’s not so small as I tend to link series together and I’ve been watching The Borjas just before this series, and to be honest it just confused me a lot on the time where the series was set. That aside this “series diary” is great!